Anchorman Ice Cream? – Love PR? 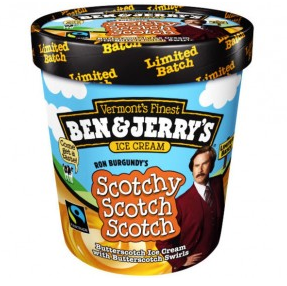 To celebrate (or should I say piggyback…) the upcoming release of Anchorman 2: The Legend Continues, Ben & Jerry’s ice cream company has unveiled a new flavour to honour the newscaster’s love for scotch whisky. The ‘Scotchy Scotch Scotch’ flavour does not contain any alcohol, but rather butterscotch ice cream and butterscotch swirl ribbons. It will only be available in the US. How disappointing for us! NEXT POST Next post: The never-ending intern debate.